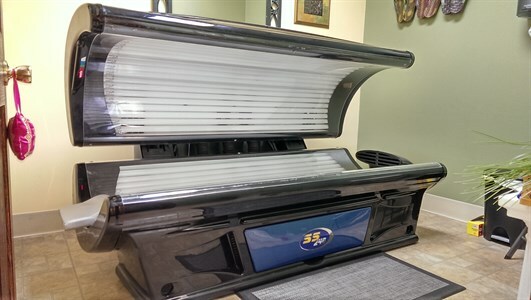 Our state-of-the-art tanning bed will provide you with a safe, effective tan in a secure, relaxed environment. Equipped with special "Bronzing Bulbs", our bed stands out among the rest. Our expert staff will assist you and ensure your comfort as you relax and enjoy the benefits of UV tanning without exposing your skin to the effects of the sun's radiation. We also carry a full line of tanning products including specialized lotions, bronzers and moisturizers that will not only improve your tan...but help preserve it as well! Combine services and save! You'll get 10% off our tanning packages when combined with any salon or spa service! Unlimited tanning for one month! Buy three months...and get the fourth month FREE! Get 20% off all tanning products when you buy any tanning package! 20 tanning sessions...customized to your skin type and tan level. Buy in bulk and SAVE! Get 20% off all tanning products when you buy any tanning package! 10 tanning sessions customized to your skin type and tan level. Buy in bulk and SAVE! Get 20% off all tanning products when you buy any tanning package! One tanning session customized to match your current tan level. $5.75 plus tax. $5.00 with any service or purchase of $20 or more.